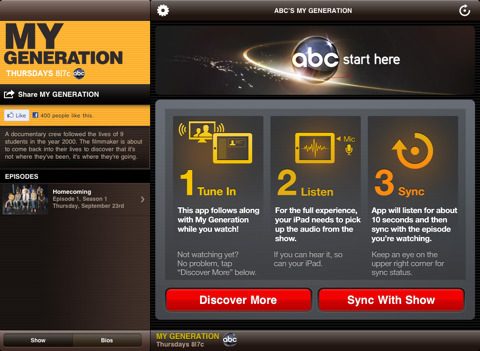 Earlier this week, The Hollywood Reporter profiled a new iPad application called ABC's My Generation Sync that relies on technology from Nielsen to offer viewers an interactive experience while they watch episodes of the network's forthcoming show, My Generation. Users who download the app can multi-task between the TV experience and the iPad, which will display polls, trivia and other content timed to be relevant to what is transpiring in the "Generation" storylines. The app will also have a social-media element, enabling sharing, posting to Twitter, as well as "liking" to Facebook, though actual feeds won't be integrated until later iterations of the app. While the episode is intended for broadcast to bring together as many viewers as possible, the app can also be utilized for those watching a DVR recording. The application works by using the iPad's microphone to pick up on audio cues embedded within the TV episode itself, allowing the application to sync up with what the viewer is watching. What Nielsen brings to the table is audio watermarking embedded in the broadcast that signals the iPhone through its microphone to trigger timed content. While the technology has always been used by Nielsen strictly for measurement purposes, a new mobile-friendly upgrade opened a new ancillary business for the company and Digimarc Corp., which is teaming up with Nielsen on what it has dubbed its Media Sync Platform. Consequently, the application will be able to sync with the TV episode regardless of whether the viewer is watching in real-time as it is broadcast or on a recording - as long as the iPad can hear the audio from the episode, it can sync. My Generation is a new fictional documentary from Disney and ABC that focuses on a group of students graduating from high school in the year 2000 and then again ten years later as they see where their lives have taken them and how they deal with returning home to visit. The show premieres next Thursday, September 23rd. While the concept of iPad apps interacting with television content would seem to hold great potential in the area of live programming, the technical challenges of attempting to serve on-the-fly content relevant to the live action makes such an implementation a bit more challenging. So for the time being, Nielsen's technology is limited to taped programming, although the company expects to have more network partners brought on board by early next year.